Locally owned and operated, our clients receive the finest quality workmanship and the most cost-effective performance available, in keeping with their highest expectations and ours. We base our business on referrals from previous customers and are eager to earn your referrals and recommendations. We look forward to working with you on all of your garage door needs, now and in the future. Over 30 Garage Doors in Our Show Room. With Fully Operational Doors. About 10% Cheaper than Lowes, Costco or Home Depot! For over twenty years, Prince William Garage Door, Inc. has been replacing and repairing garage doors one door at a time. We provide a wide variety of quality products at the most reasonable price giving you the best value for your money. But no matter what product you choose, it is no better than the quality of the installation. We have the biggest showroom in Northern Virginia. Conveniently located at 9049 Liberia Avenue in Manassas. Our showroom has over 30 garage doors on display, several garage doors are fully operational, with several different electronic opener styles to choose from. Prince William Garage Door has been in business for over 20 years. We do work for over 100 different local builders. With our strong buying power, you will find our prices to be better than the retail stores with top quality professional installation and repair. We install only the best products and offer a complete line of garage doors that are not only an integral part of your home or business’s style, but are durable and reliable too. Whether you are looking for carriage style garage doors in wood or steel, or a fully insulated traditional raised panel steel garage door, we have the product for you. We offer a choice of unique designs to enhance your home’s curb appeal. 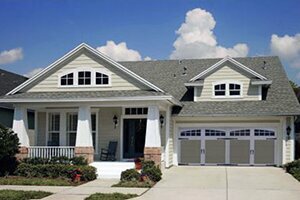 Choose wood, steel, or composite garage doors in a variety of styles and sizes. Be sure to complete your garage door purchase with the convenience, safety, and security of a garage door opener. We are an authorized dealer of several openers designed to work in different environments. Is silence a need? What about durability? 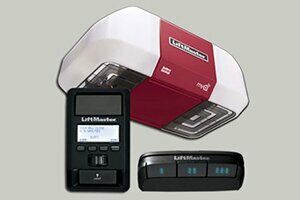 Come to our showroom and see several garage door openers in action. See and hear the difference before you buy. Prince William Garage Door sells both belt drive and chain drive garage door motors for residential and commercial applications. Be sure to visit our Gallery for photos of our show room, recent jobs and more. Proud to Share We Do a Large Number of Installations for Sales at Home Depot. Garage Door Problems? You’ve found the solution!